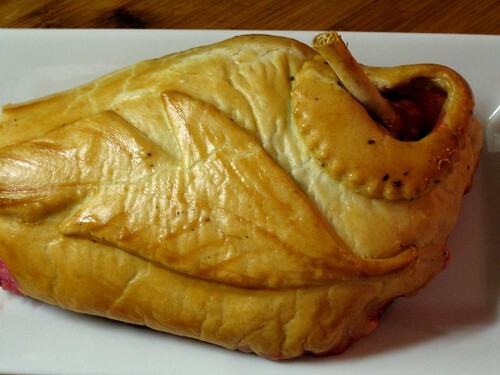 A piecemeal representation of the venerable Coq en Pâte, a whole rooster baked in a savory pastry crust generally decorated and molded so as to suggest a poultry form. In this case a Frenched and brined chicken airliner. Baked in a butter and lard based pâte à foncer (50% short crust). Seam is on the bottom and the chimney makes room for the bone while allowing steam to escape. Decorative feather emotes the bird within. 4 coats egg wash. Cavity is then filled with aspic made from reduced consommé. Must be baked at a very high temperature to ensure that the pastry has a chance to cook before the chicken breast overcooks and shrinks down to nothing. A layer of toasted coarse breadcrumbs may absorb any of the excessive juice the chicken might release. 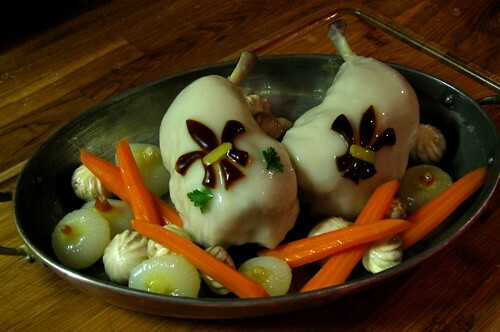 Chicken hams in chaud-froid with aspic fleur-de-lys. Chicken legs frenched, the thigh bones removed, skinned, stuffed with the bird’s giblets and oysters, pistachios, my lardo and poached. Gelatine and a white roux is added to the cooking liquid (chaud-froid) in proper béchamel proportions. 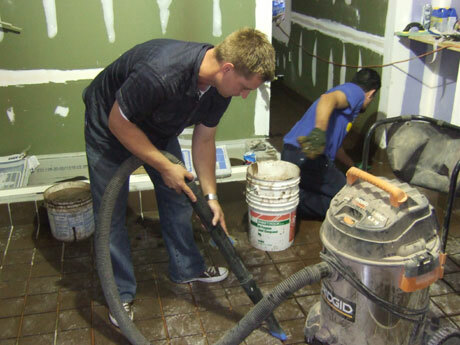 The chilled legs are placed on a wire rack and napéed many times with the chaud-froid until an even coating is achieved. Excess is melted and ladled over again as needed. 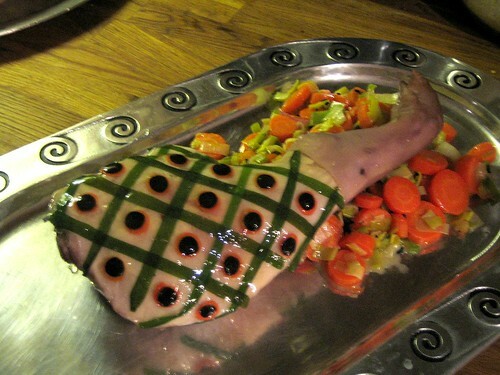 Dark aspic is made from soy sauce, water and gelatin. Sleight of hand “truffle découpage” can be made with a few drops of activated charcoal or squid ink in the gelatin and perhaps ground dehydrated black olives. 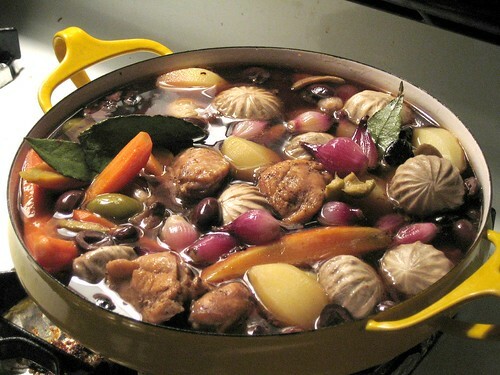 Garnished with fluted mushrooms, beveled carrots and cipollini onions à la Grecque. The clear favorite among Bravo’s aspiring chefs is 20-year veteran Eve Aronoff, chef/owner/cougar of her eponymous 6-year old restaurant “Eve” in Ann Arbor, MI whose triumph is trumpeted by none other than Mario Batali, Alice Waters, Ulterior Epicure, Slowfood’s founder Patrick Martins and Carolyn S. from Yelp. Incumbent chef-owners/partners have nothing to lose (or gain) in this soap-flavored game show (other than dignity and reputation) and like the Olympics are much more serious and refreshing to watch now that dopey amateurs have been cut. Eve believes in the philosophy of French cooking (her Bravo bio is cut & pasted from her own website) and has Thai dumplings, Thai BBQ chicken, Cypriot cheese, curried mussels, nachos, risotto, coconut-ginger rice, beef chimichurri, macadamia encrusted salmon, tres leches and French bread on her menu. Bravo! She’s a sure bet in winning enough plastic wrap and not-so-biodegradable to-go tupperware to help open a Club Med franchise. If not, she can always fall back on the dream of owning her own restaurant which she has already fulfilled and the current cougar trend. Jolly flood victim and virgin hippie Kevin Gillespie may give the editors and lighting technicians more of a challenge than the other contestants based on the reflective nature of his pasty skin. It might crisp up nicely under powerful lights or could provide a Rubenesque canvas for a whimsical approach to the body-sushi-sandwich quickfire challenge. Sideshow oddity Jesse Sandlin gives me the willies. The combinationof heft, metal thing through her lip and attention seeking tattoos make my testicles tingle (in a bad way), the sensation many males feel on the first descent on a roller coaster. So does “ranch “dipparoo”“ that accompanies the fried chicken at Abarcrombie Fine Foods which shares the distinction of being “world-famous” with hundreds of small town coffee shops, campy happy-hours and Virgin Island mahi-mahi burger shacks that I was unaware of until reading theself-professed planetary recognition in their windows.